Protected by up to 14 patents, the Sky-Dweller is one of Rolex's most complex watches. This timepiece unites user comfort and technical ingenuity and features an annual calendar and a second time zone. Timepieces from Rolex are world famous for their reliability, robustness, and precision. Models such as the Submariner, one of the first diving watches, only have select extra features like a date display and a rotating bezel. The Sky-Dweller, however, is completely different. This watch, with its 42-mm gold case, features an annual calendar and date display, as well as a second time zone. Depending on the model, up to 14 patents protect this Rolex. Therefore, it is considered to be one of Rolex's most complex timepieces along with the Yacht-Master II. 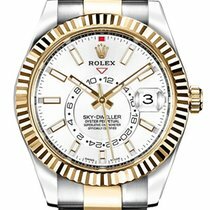 The Sky-Dweller is the first Rolex to feature a GMT function and an annual calendar. At the end of each month, the date changes precisely to the next day. You only have to manually correct the date after February 28th or 29th. An off-center 24-hour disc displays a second time zone with the help of a red triangle beneath the logo at 12 o'clock. How much is a Rolex Sky-Dweller? 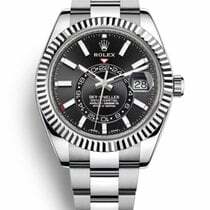 You can purchase a new Rolex Sky-Dweller with the reference number 326934 in stainless steel and white gold (Rolesor) for around 19,400 USD. Pre-owned models are currently hard to come by and are therefore only slightly less expensive. Bicolor variants in stainless steel and yellow gold have the reference number 326933 and go for about 18,300 USD. The timepieces made of solid 18-karat gold are especially elegant and come with either a leather strap or a three-piece link Oyster bracelet. 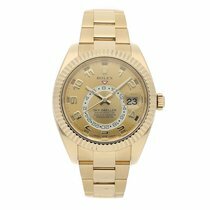 A yellow gold Rolex Sky-Dweller with a brown leather strap demands around 29,600 USD in mint-condition and 27,800 USD pre-owned. A never-worn model with a yellow gold Oyster bracelet costs somewhat more at 37,000 USD. Thanks to its white gold case, the Rolex Sky-Dweller with the reference number 326939 feels a bit more discreet than its yellow gold sister model. Prices for models in mint-condition sit around 38,500 USD. At almost 33,300 USD, pre-owned models are a good 5,000 USD less expensive. When paired with a black leather strap, this white gold Rolex costs about 30,900 USD new and 28,400 USD pre-owned. The versions in 18-karat rose gold, known at Rolex as Everose gold, are just as desirable. Models in mint condition with a rose gold Oyster bracelet and the reference number 326935 demand around 39,900 USD, while those with a brown leather strap go for approximately 30,900 USD. Pre-owned examples are currently only slightly less expensive. A unique feature of the Rolex Sky-Dweller is its rotating, fluted Ring Command bezel . Turning the bezel controls the watch’s functions, similar to the Yacht-Master II, a regatta chronograph for professional sailors with a countdown function. The bezel functions in this way: After unscrewing and pulling out the crown, you turn the bezel left until it locks into place at 11 o'clock. Then, you can set the date by turning the crown in either direction. The month is set in the same way. If you keep turning the bezel left to 10 o'clock, you can set the local time. The usual three hands for hours, minutes, and seconds display the local time. If you turn the crown, the hour hand jumps forward or backward. The date can be set this way as well. If you turn the bezel even further to nine o'clock, you can set the home time (on the 24-hour disc) together with the hour and minute hands. Since the caliber 9001 has a balance stop, the second hand does not move in this position, making it possible to set the time to the exact second. While moving the bezel, the crown should remain pulled out; that way, you won't damage the caliber. You can wind the watch with the help of the crown in any of the bezel's three positions. For the Sky-Dweller's annual calendar, Rolex displays the months using rectangular windows next to the 12-hour markers. The window corresponding to the current month is filled with a contrasting color. For example, if it's July, the window at 7 o'clock will be colored in. As a tribute to the astronomical phenomenon called the Saros, Rolex named its annual calendar Saros. Thanks to the Sky-Dweller's 24-hour scale, it's easy to distinguish night from day. The disc is fully visible and slightly raised from the dial. The minute and hour hands also contribute to the watch's readability. Each hand is partially skeletonized, making it possible to view the fixed red triangle displaying the second time zone, even when the two hands overlap. The hands also contain luminous material so that you can read the watch easily in the dark. Rolex uses the well-known, reliable Oyster case for the Sky-Dweller model. 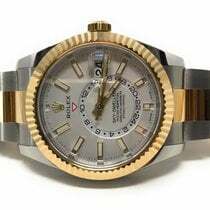 At 42 mm, this watch is one of Rolex's largest on offer due to the caliber 9001 and its functions, keeping up with the modern trend toward weightier watches. In terms of material, you have a choice between yellow, white, or Everose gold and Rolesor models made of stainless steel and gold. Everose is a special, in-house rose gold alloy introduced by Rolex in 2005. Like the other gold versions, it's cast in Rolex's own foundry. There's no missing this piece of gold on your wrist: At around 250 g, the Sky-Dweller is one of the heaviest Rolex watches. For the band, you have the choice between a gold, three-piece link Oyster band and an alligator leather strap, available in brown or black. The Oyster bands feature a special clasp mechanism which allows you to lengthen the band by 5 mm. This is a practical feature for hot summer days when the wrist swells due to heat. The Sky-Dweller's design is also close to the sporty-elegant Rolex Day-Date, which displays both the date at three o'clock and the day of the week written out at 12 o'clock. A fluted bezel and Roman numerals emphasize the watch's stylish look. The Sky-Dweller's unique bezel has another advantage: It's easier to grip and turn than a smooth, polished bezel. The yellow gold models feature Arabic numerals, giving them a sportier look, while Roman numerals lend these gold watches a more classic touch. The white gold editions are a bit more subtle, as they're not immediately recognizable as solid gold. The Rolex Sky-Dweller with a blue dial is one of the line's most popular models. Its case and bracelet are made of stainless steel and white gold. Rolex has been known for their robust and precise movements for decades. Every caliber receives a certificate from the Official Swiss Chronometer Testing Institute (COSC) and undergoes an additional test from Rolex. The inscription Superlative Chronometer on the dial indicates the movement's high precision. The same goes for the Sky-Dweller, which is powered by caliber 9001. Rolex introduced this movement in 2012 with optimizations and additional functions that significantly set it apart from the standard caliber 3135. One improvement is a ball-bearing rotor, which is also found in the chronograph movement 4130. In comparison to plain bearing rotors, which are found in other Rolex movements, ball-bearing rotors are considered to be less susceptible to wear and tear. Like the 4130, the 9001 has a power reserve of 72 hours. Thus, you can take your watch off over the weekend and put it back on Monday morning without any problems. Rolex watchmakers have also perfected the balance bridge. With the help of four knurled screws, you can finely adjust the balance staff. The watch also features the typical Rolex Microstella nuts on its balance rim. Additionally, the movement has a blue Parachrom balance spring made from a non-magnetic zirconium-niobium alloy. The special Breguet spiral ensures a high level of accuracy, as does the precision index adjuster. The movement is also protected from shock and jolts by Rolex's Paraflex shock system , which provides cushioning for the balance wheel as well as the escape wheel. Compared to the Incabloc shock protection system, this mechanism offers better protection against shocks and can more effectively return the balance staff to the correct position. Although the movement is hidden behind a polished screw-down case back, it's still decorated. A skeletonized, sunburst rotor and sunburst bridges, polished screw heads, and golden inscriptions all make this caliber an even more beautiful piece of art.